I still remember the first bath we gave my daughter in the hospital. As naturally as I thought parenthood would come to me, it was strange, she was so small, and I’m pretty certain I still had a lot of drugs running around in my system after birth! For a child who we now use bath time as a wind down/bribery tool for good behaviour as she loves it so much, the first bath was loud and chaotic! She cried, my husband did his best to hold her head out of the water and we managed to capture the entire thing on video - including the moment I reach across and grab his finger and put it in her mouth as a dummy (it worked!). Bath time can be a really peaceful way to end the day, not to mention to wash away 12 hours of grub - food, dirt, sweat and probably some nappy residue! It can also be stressful though, as we as parents get constant reminders about how quickly babies can drown if left unattended. Did you know drowning is the biggest cause for death in children under 5? Such a horrible, scary and generally preventable statistic. Even if we are constantly with them, water and babies are slippery and messy and sometimes you just need some help with some tips on keeping everyone safe and sane. My first tip, which has been shared before but was such a game changer in our house hold is the introduction of the bath mat. I was sceptical at first, because I didn’t think it would do much good (aside from making my pretty white bath gleam with the print of turtles and whales which wasn’t doing great things for the aesthetic). We introduced it as our son was moving from the infant bath insert where they lay down in an incline, to sitting. He wasn’t quite stable enough to sit unaided outside the bath, let alone in the water, so it meant awkwardly hovering over trying to hold him as he played and his sister splashed. Not relaxing at all, you can imagine the scenario. Once we put the bath mat in, his stability dramatically improved, and we no longer had to hold him at all! Something we second guessed a lot when we brought our babies home was bath temperature. My husband likes his showers quite mild, whereas I like them pretty scalding - what was a good temperature for a baby? A safe number is between 37-38 degrees, and there are some easy ways to try and manage this. If you don’t have a system in your house that regulates the temperature for you (from your hot water system, we have the Rinnai Infinity which is incredibly helpful), always fill the bath with cold water first. It’s the safest way to make sure no body gets burnt, if you leave the room briefly as it is filling (without the kids in the bath of course) and somebody climbed in, plus its easy to add hot water. Having a bath temperature gauge is handy, and a fail safe option for knowing whether the kids will be too hot. Failing that, test the water on your wrist or inside of your elbow, just like you used to when heating up they bottles! 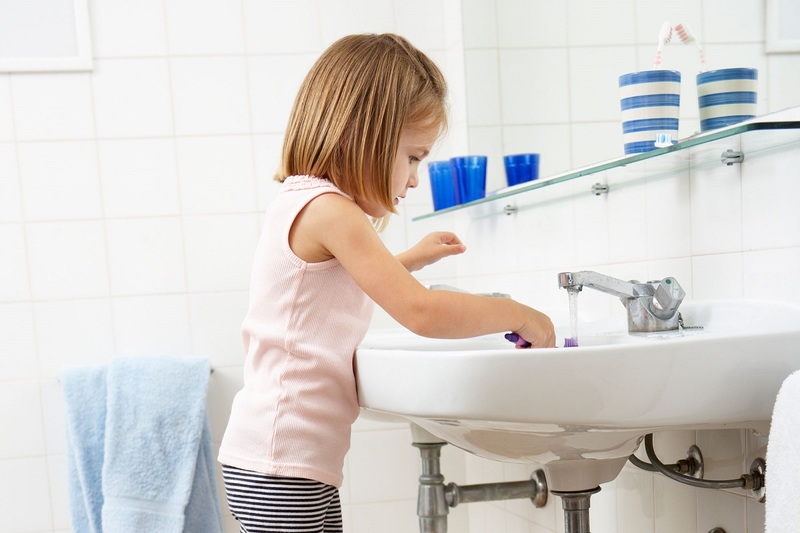 Turn the taps off with force - my toddler can turn the taps on by herself now if I haven’t put some real muscle behind it. The addition of a bath tap cover is also brilliant to make sure they don’t lean on them and get a nasty scald or knocks when they’re climbing. Filling up your bath past your children belly button height is not only unnecessary but not great for your water bills! Kids don’t need any more water than that to splash around and play in, and bathing them every night uses a lot. Even with constant supervision, if a child slips under a full bath they will definitely inhale some water, whereas if my son falls down on his back, his mouth and nose are still above water height - it doesn't even bother him, he thinks it is funny (as I have a small heart attack!). Preparation, as with anything when it comes to kids, is paramount! You pack a nappy bag when you leave the house, so why not make sure you’re super ready for bath time? Make sure you have your phone with you (in case in rings and you’re pulled away), have the towels ready to go and keep toys in the bath specifically for bath time so you’re not having to leave and grab more - a bath toy bag is perfect. We recently ditched the standard bath toys and started using cups and tupperware - the kids play with them much more and they don’t get mouldy like the ducks were. We have the towels for the kids hanging on the back of the door, and I have their pyjamas on the change table. Outside of the bath, we encourage our children to be an independent and hands on as much as possible, which can be a little dangerous if not set up well. We have steps for the toilet with a child seat on top during the day so our daughter can take herself to the toilet without assistance but not fall in, and we keep her toothbrush and paste in a spot where she can easily reach them. She feels like she is being able to do a lot of things for herself, it certainly gives me a break, and it’s done in a way that things wont break or compromise the kids safety. Now that she is enjoying dressing herself as well, I’ll start bringing her clothes into the bathroom so that she can get ready while I look after her brother who is smaller, and needs me to watch out for him more. If all else fails, get in the bath with the kids - I do it all the time. They think its hilarious and wonderful, no one can fall under without me being right there, and we’re all clean! I suppose it helps that I am 5 foot 1 though.